Tahoe Gear Carson 14 person tent. 3 Rooms + screen room. This tent is available on Amazon. So follow the link and benefit from their efficient shipping service. The title of this text gives the name of the tent as suggested by the manufacturer, and it describes several of its features. But this is a summer camping tent and not a 3-season tent, more below. This is an impressive construction that includes three inner rooms plus a huge screen room. I do not remember any tent with such a large screen room, so I have included it in my list of best tents with screen room. By its shape, this is a cabin-style tent with almost vertical walls and huge windows on all sides, very pleasant and very functional. Note that such a structure is not freestanding, so choose the camping place where you can stake it down properly. With so many windows around, the fly is naturally partial coverage type, so it covers the ceiling only and the screen room. I stress here that the ceiling room is the part of the overall construction. The picture below shows the inner rooms as seen from the front screen area. Tahoe Gear Carson Cabin Tent inner view. As you realize each of the three rooms has its own access to the screen room, and also to the central room, which is a really functional design. The central room is pentagonal and it can serve as a living area, see the floor plan in the section farther below. The central room is 94 inches (239 cm) tall and this is why I have included it in my list with extra tall tents. This is view through the main door. Space-wise, the declared capacity is 14 people, so let’s see what this tent offers. The floor plan is given below, so if you add up all the rooms you will realize that it offers 182 ft² (17 m²) in the inner area. This gives 13 ft² (1.2 m²) per person. So the declared capacity makes no much sense. Note also that the dimensions of the side rooms are square which is good, 7 x 7 ft (2.1 x 2.1 m), but there is no way to fit four people side by side, as the picture below given by the manufacturer suggests. I would say each of these rooms can accommodate 3 people, and you can have enough place for 4 people in the central pentagonal room. This would make it 10 people in total. Realistically, for a family camping, this should still be reduced. 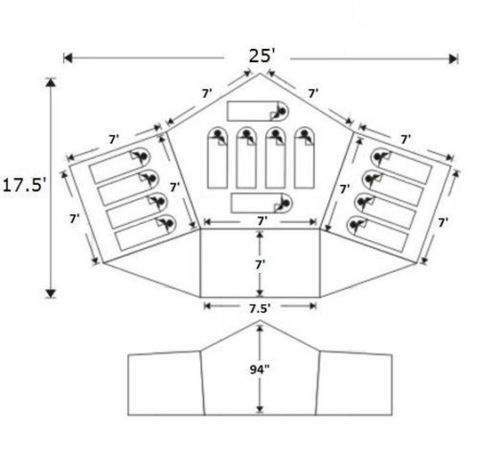 The floor plan and the main dimensions. Note that the screen room is huge and it is covered by the fly, but the sides are without panels, see the picture below, and this area is not fully protected. In any case, the screen room alone offers around 94 ft² (8.8 m²). The fly covers it completely so a bigger part of this screen room is protected from rain and you can indeed keep lots of stuff here. So this is a camping castle in true sense. Side view showing the screen room size. Seasons-wise, this is a structure with lots of mesh suitable for warm weather camping. 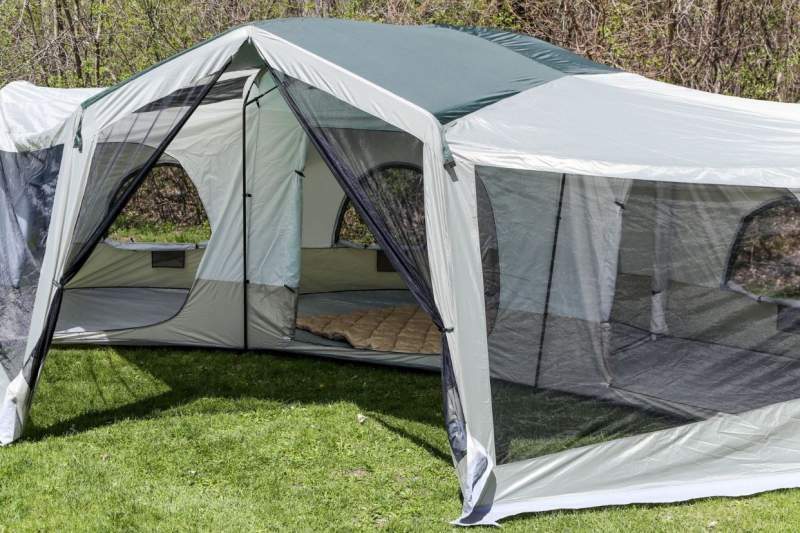 The waterproof rating is low, the fly is minimal, and the tent is extremely tall. Even if everything is perfectly done, this is a huge surface with many seams and openings, so many things can go wrong. Therefore, in my view this tent is best suited to calm weather camping without much rain and wind. Weight-wise, this is a heavy item, the tent weighs 61.9 lb (28 kg). But this is not surprising in view of its size. The packed size is appropriate 37.7 x 16.2 x 13.2 inches (96 x 41 x 33 cm). So this is something to be transported in the car only. one main entry point on the screen room. All the windows and the inner doors facing the screen room are with mesh and with zippered panels for protection from elements and for privacy. The picture below shows one of the two inner doors and you realize how big the inner doors are. You also see that the rooms are truly divided, so this is not just a curtain between the central and the side rooms. One of the inner doors is visible and the inner wall between the rooms. There is a lot of work here, so this is a tent you would not want to move from place to place frequently. You start by assembling the roof structure of the central pentagonal room and then add the 4 legs poles. When the central room is up, you start raising the two side rooms. After that raise the screen room and add the fly. One person can do all the job but it is easier if two people work together. The whole set is shown in the picture below. These are steel vertical poles and shock-corded fiberglass poles used for the roof. These are all poles in the package. The body and the fly are 70D/190T polyester with 1000 mm waterproof rating with taped seams. The floor is 120-gram polyethylene with welded seams. The mesh on the openings and on the screen room provides cross ventilation while keeping out pesky mosquitoes. 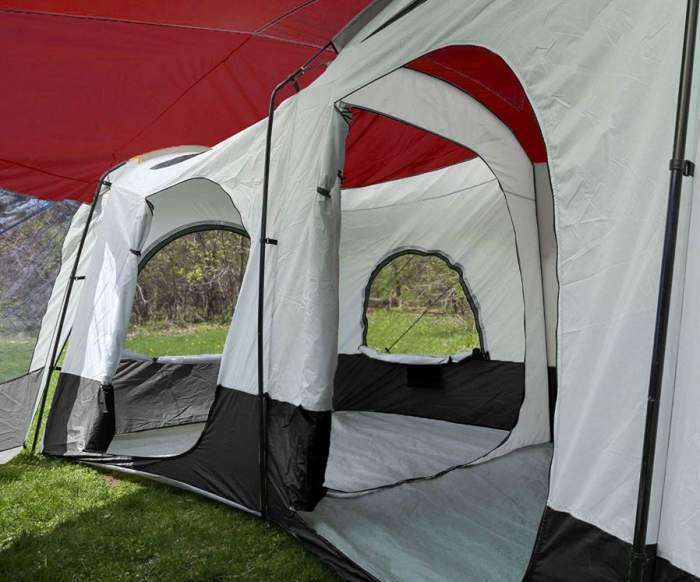 Note that the tent is available in two very different colors and the prices are very different but I did not see any difference in functionality . 11 Steel + 11 fiberglass poles. Not so easy to set it up. This tent is on Amazon with the price tag around $265 in one of the colors. This is a fair price for such a tent. It has received a number of reports by Amazon customers and the average rating is respectable 4.0/5. Please see how I rate it, the same criteria are used for all the tents here in the site, for an easy comparison. Weight: 61.9 lb (28 kg). Dimensions: 25 x 17.5 ft (762 x 533 cm). Inner area: 182 ft² (17 m²). Inner area per person: 13 ft² (1.2 m²). Screen room area: 94 ft² (8.8 m²). Total covered area: 276 ft² (25.8 m²). Peak height: 94 in (239 cm). Packed size: 37.7 x 16.2 x 13.2 in (96 x 41 x 33 cm). So this tent is indeed huge, but the best way to understand its features is to see them side by side with some other tents with the same or similar declared capacity. This is why I give the table below with two tents from Ozark Trail. As you realize, this Carson 14 looks small when compared with one of them, who would say. It is more expensive, it has the screen room which is missing in the other two tents, but one of the Ozark Trail tents is an instant setup. Please follow the links for more details. This Tahoe Gear Carson 3-Season 14 Person Large Family Cabin Tent is really nicely built and the price is appropriate. But just ignore the 3-season phrase which they use in the name, it makes no sense, this is a great tent for summer camping and for warm and calm weather in general. 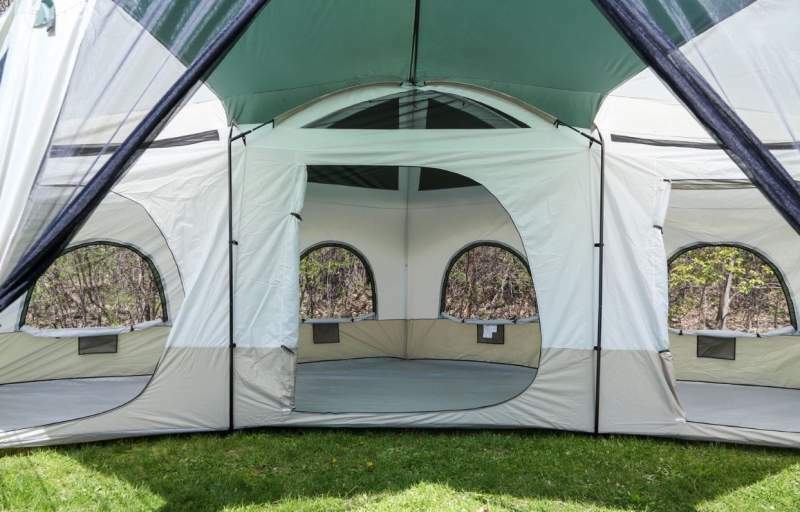 I have included this tent in my list of 4-room tents, so if you need to see more options just follow the link. Please note that this is not a sponsored text and I am not paid by the manufacturer. There is a comment box below so please use it in the case of questions or comments. Have a nice day.